1st-, 2nd- and 3rd- Degree Murder, Manslaughter, Aggravated Battery/Assault, Battery on a Law Enforcement Officer, Armed/Strong Arm Robbery, Burglary, Home Invasion, Sexual Battery, Domestic battery, Simple Battery/Assault. Trafficking (all controlled substances), Sale of a Controlled Substance, Sale within 1,000 ft. of a School, Possession with Intent to Sell, Possession of a Controlled Substance, Prescription Fraud, and Doctor Shopping. Grand Theft, Fencing, Possession of Stolen Property, Simple Theft, Retail Theft, Damage to Property, Racketeering (RICO), Embezzlement, Bond Fraud, Computer Fraud, Theft of Intellectual Property, Pharmacy Fraud, Medicaid Fraud, Organized Scheme to Defraud. Vehicular Homicide/Manslaughter, DUI Manslaughter, DUI with Property Damage or Personal Injury, DUI (Breathalyzer, all drugs or no blow), Driving on a Suspended License (DUS), & DUI. Violations of Probation: Probation reinstatement. 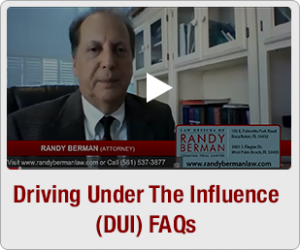 A Florida criminal trial attorney for over 33 years, Randy Berman has handled thousands of criminal cases, from first-degree murder and robbery to drug crimes and DUI. Our firm offers clients the wisdom and success accumulated over three decades in the courtroom. 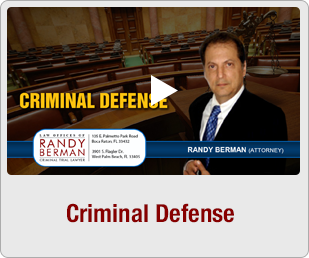 As a former Assistant Public Defender and Assistant State Attorney, including service as chief of the Felony and Capital Crimes Divisions, Florida lawyer Randy Berman fully understands the nuances of the criminal justice system and how to make them work for his clients. He adheres to the highest standards and strives always to ensure his clients’ rights are protected. Randy’s skills are widely recognized; his cases receive media attention, and he is frequently asked by media representatives to offer legal opinions. Randy is also a certified expert in pharmacologic and other drug matters. His combined experience in these different fields of the legal community contributes to his success as a lawyer in South Florida. He offers representation to clients throughout Palm Beach County, including Palm Beach and West Palm Beach, Boca Raton, Delray Beach, Boynton Beach and the surrounding Counties of Broward, Martin, Miami-Dade, Indian River, Okeechobee & St.Lucie. Randy chose to be the sole practicing attorney in his law office instead of a Florida lawyer in a large firm because it permits him the opportunity to provide clients the utmost personal attention and an immediate response to their needs. Unlike other Florida lawyers who can’t or won’t provide you their undivided attention and leave you feeling like you’re getting the run around, Randy Berman prides himself on answering his own phone and handles every aspect of a case, giving clients peace of mind with the knowledge that their concerns are being addressed. 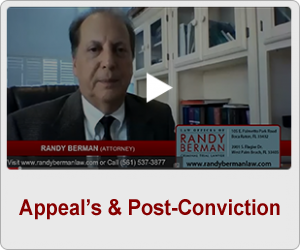 Florida lawyer Randy Berman has a reputation in the South Florida legal community among other criminal defense attorneys and with the courts for using novel arguments to win cases. As a diligent and dedicated lawyer, Randy reviews every aspect of a case, looking for avenues of defense. Strategies are tailored to the facts of individual cases. Early intervention has resulted in police choosing not to file charges. He has won acquittals from juries and judges, obtained dismissals, and even achieved conviction reversals on appeal. He has experience and confidence that shows in his ability to communicate and win over a jury. He got me NOT GUILTY verdict on a DUI charge, the jury was out five minuets. Mr. Berman is an amazing lawyer! I had a DUI charge. I was driving with no head lights, I refused the breath test and I failed all the road side test. I was very nervous and scared that I would get convicted of a DUI and it effecting my future. Mr. Berman always answers his phone and that is a definite plus! He knows what he is doing and is amazing at trial!! Because of him the jury found me not guilty… I definitely recommend him to be your lawyer. After interviewing a couple of attorney’s I am very glad we chose Mr. Berman to represent my son. My son had a couple of pending charges and Randy was very knowledgable and competent in handling each one. He always gave my son good advice and was always available to answer any question. The fact that he picked up his phone immediately and returned messages right away is a definite plus for any lawyer. We are very pleased with the outcome of my sons case and highly recommend him as an attorney.